Microgreens…what the heck are they? Well…they are, basically, sprouts grown in dirt. I got some from superseeds.com a/k/a Pinetree Seeds of Maine, a family business which has been around since 1979. I have found it to be a great place for inexpensive, good quality seeds and plants. I get most of my seeds there. Going gluten free has lead me to continue searching for healthy food choices and I always loved sprouts so this past winter I bought a packet of these microgreens. I chose the kitchen sink variety; a mixture of many greens and veggies. I planted them 1/3-1/2 inch deep in seed starter medium. Watered them well, and waited. In just 4-5 days the first shoots appeared. I was thrilled with the more than 95% germination rate. That meant that my pot was packed solidly with tiny shoots. Maybe a tad too tightly……. I put them in the kitchen window sill. Watered them almost daily and turned them around every other day. Some grew extra fast; pea shoots that were nearly 2 inches taller than the rest of the plants. In less than two weeks I was getting out my kitchen scissors and snipping off a section of my shoots to toss on a just made salad. This boosted the nutritional value of my salad considerably. Not to mention the interesting flavor of all those tangy sprouts! Sprinkled on my salad they added lots of phytonutrients, vitamins and minerals. They are a great flavor booster for your side or main salad. The term is generally used to refer to those chemicals that may have biological significance, for example antioxidants, but are not established as essential nutrients. Scientists estimate that there may be as many as 10,000 different phytochemicals having the potential to affect diseases such as cancer, stroke or metabolic syndrome. From: http://en.wikipedia.org/wiki/Phytonutrients. FYI: Wiki Links uses phytochemicals as a synonym of phytonutrients. Currently, the terms “phytonutrient” and “phytochemical” are being used interchangeably to describe those plant compounds which are thought to have health-protecting qualities. Anyhow, definitions aside, microgreens are chock full of those healthy phytonutrients as well as crunch and flavor. A small handful would be perfect in a spring salad or on top of a burger. So, if you are not much of a gardener but want fresh salad stuff that is cheaper, fresher and healthier for your body than you can buy just about anywhere, get some packets of microgreens and start planting! 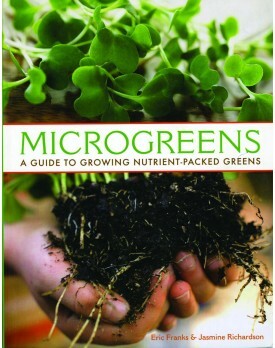 If you want to learn more Pinetree seeds has a book for sale called Microgreens by Eric Franks and Jasmine Richardson. If you don’t have any pots lying around most any container with drainage will do. Actually, I used a half and half container scrubbed clean and laid on its side with the uppermost side cut off and a few holes punched in the bottom. I filled it with potting soil. Do avoid soil mixtures with “miracle grow” in them. Get plain soil, preferably organic. This is as easy as gardening can be. I promise that in a few short weeks you will be able to cut and enjoy your own super sprouted greens. Go forth and sprout!